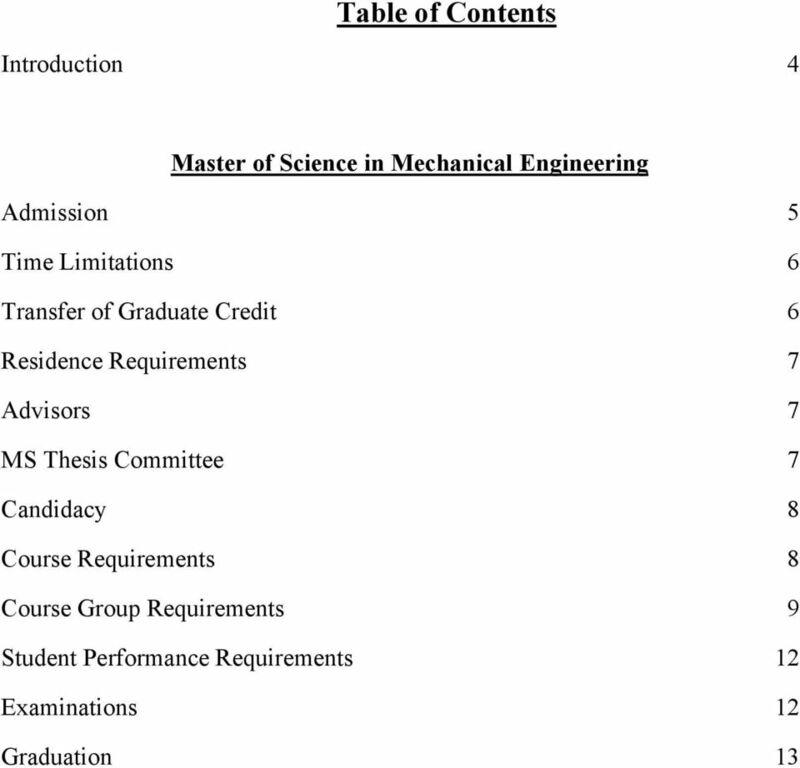 Download "HANDBOOK FOR GRADUATE STUDENTS MECHANICAL ENGINEERING. College of Engineering. Wayne State University. Detroit, Michigan"
4 Introduction The primary source of information about graduate programs at Wayne State is the Graduate School web page. From the Graduate School web page you can download Admission Application forms. This handbook has been developed to provide you with an understanding of the policies and regulations governing admission, academic standards and student obligations within the M.S. 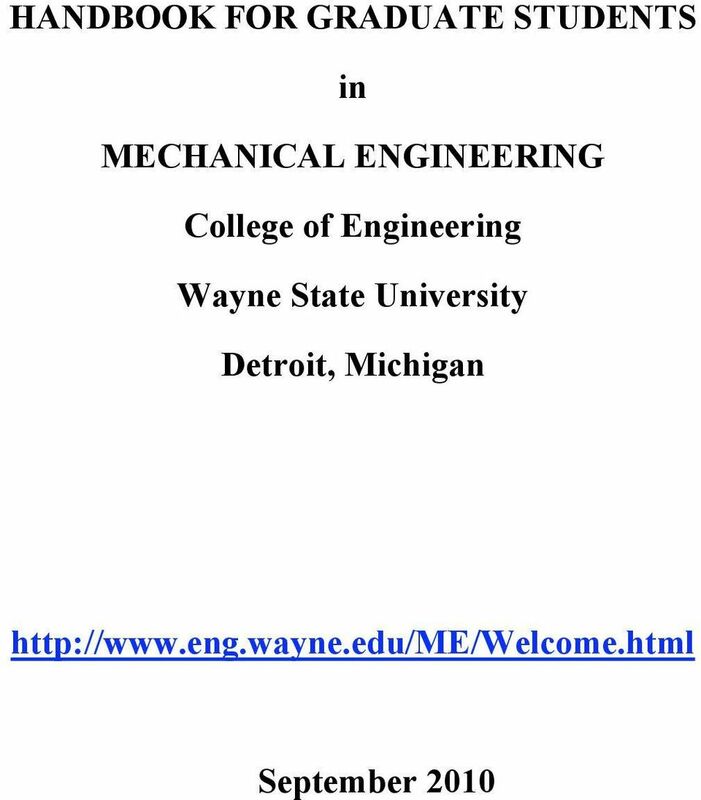 and Ph.D. programs in Mechanical Engineering, focusing on College and Departmental requirements that are in addition to the general requirements listed by the Wayne State Graduate School. This handbook is divided into two main sections, the first deals with the MSME degree and the second with the Ph.D. degree. At regular intervals you should carefully review the Graduate School web page and this document to ensure that you are in compliance with specific requirements of the University, the College of Engineering, and the Department of Mechanical Engineering. 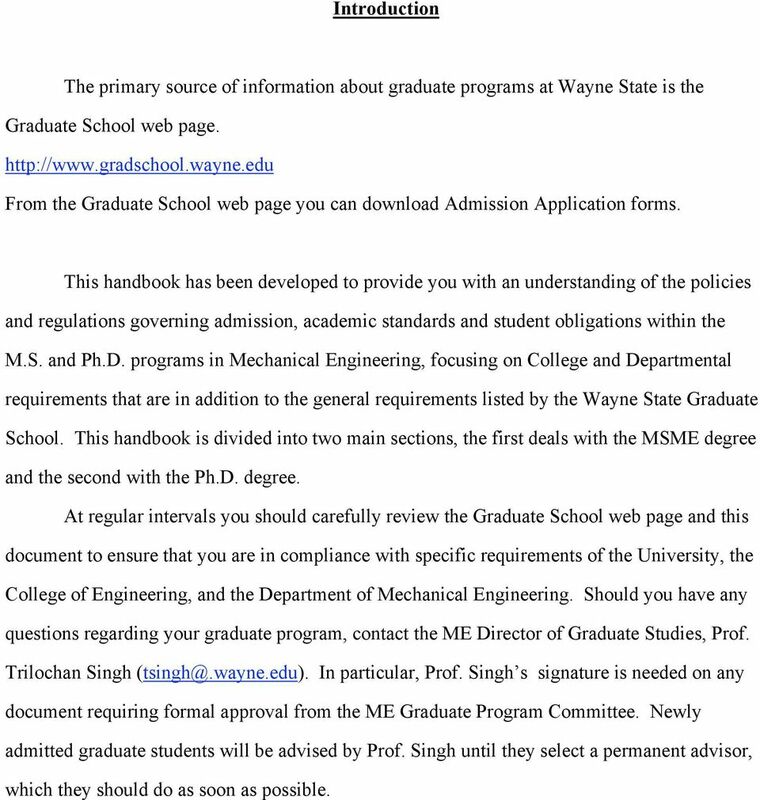 Should you have any questions regarding your graduate program, contact the ME Director of Graduate Studies, Prof. Trilochan Singh In particular, Prof. Singh s signature is needed on any document requiring formal approval from the ME Graduate Program Committee. Newly admitted graduate students will be advised by Prof. Singh until they select a permanent advisor, which they should do as soon as possible. 7 (c) (d) not used toward the requirements of another degree; and certified with grade B or better (B minus credit is not acceptable for transfer). A maximum of eight semester hours may be transferred towards the MSME. 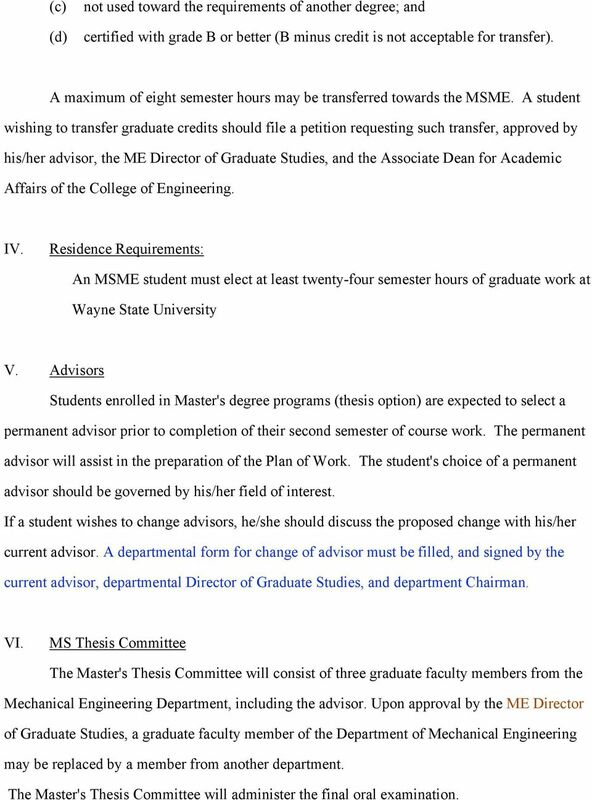 A student wishing to transfer graduate credits should file a petition requesting such transfer, approved by his/her advisor, the ME Director of Graduate Studies, and the Associate Dean for Academic Affairs of the College of Engineering. IV. 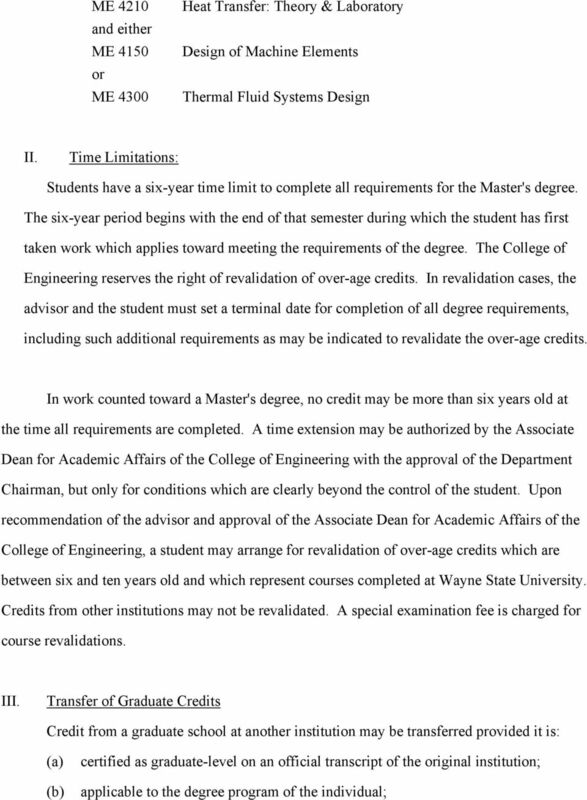 Residence Requirements: An MSME student must elect at least twenty-four semester hours of graduate work at Wayne State University V. Advisors Students enrolled in Master's degree programs (thesis option) are expected to select a permanent advisor prior to completion of their second semester of course work. The permanent advisor will assist in the preparation of the Plan of Work. The student's choice of a permanent advisor should be governed by his/her field of interest. If a student wishes to change advisors, he/she should discuss the proposed change with his/her current advisor. A departmental form for change of advisor must be filled, and signed by the current advisor, departmental Director of Graduate Studies, and department Chairman. VI. MS Thesis Committee The Master's Thesis Committee will consist of three graduate faculty members from the Mechanical Engineering Department, including the advisor. 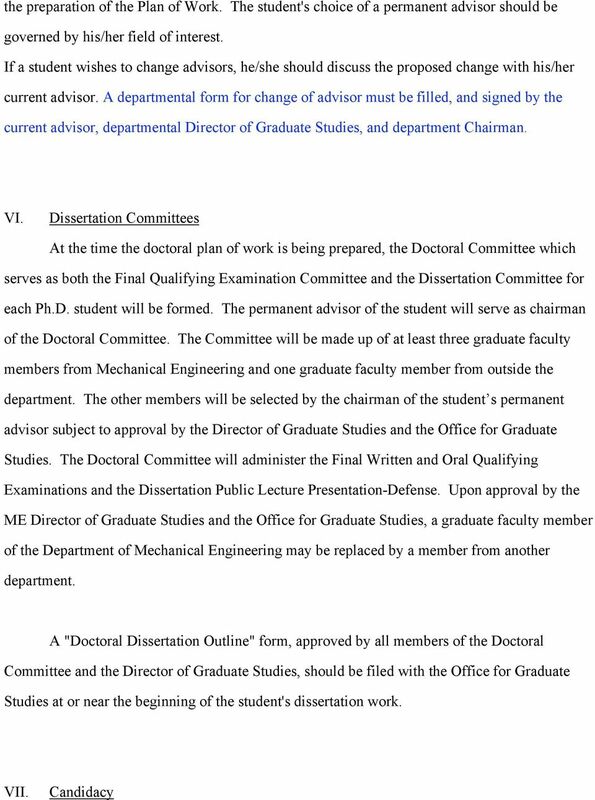 Upon approval by the ME Director of Graduate Studies, a graduate faculty member of the Department of Mechanical Engineering may be replaced by a member from another department. The Master's Thesis Committee will administer the final oral examination. 8 VII. Candidacy Students enrolled in Master's degree programs must file a Plan of Work by the time the equivalent of eight semester hours of graduate credit have been earned. 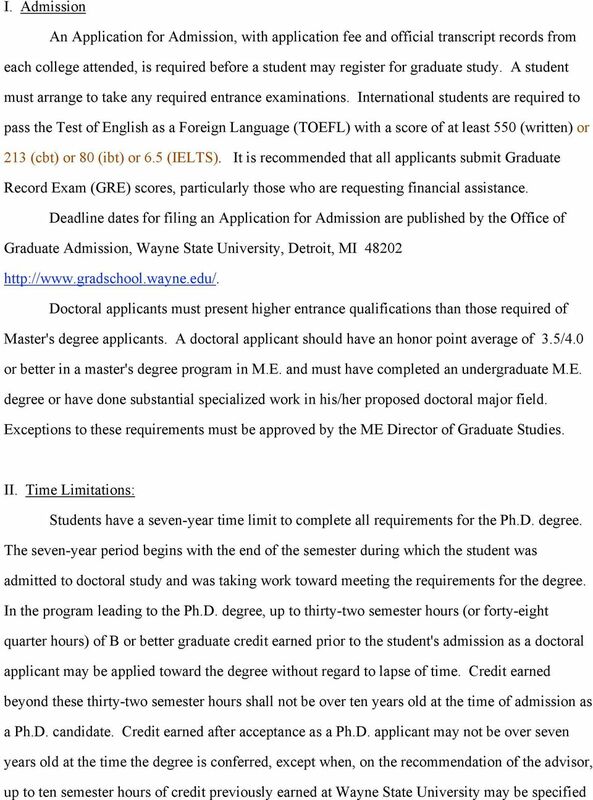 In addition, MS thesis students must file a thesis outline form by the same time. 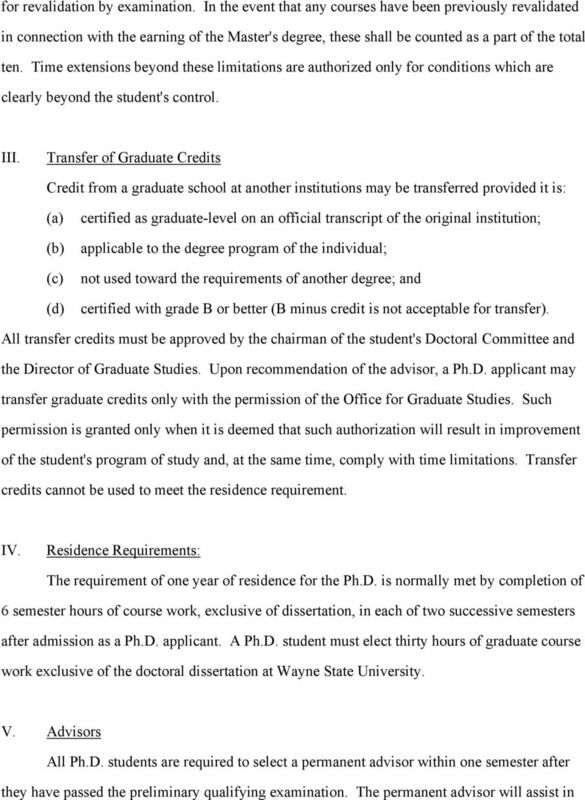 Both the thesis outline and Master's Plan of Work must be approved by the Director of Graduate Studies. VIII. 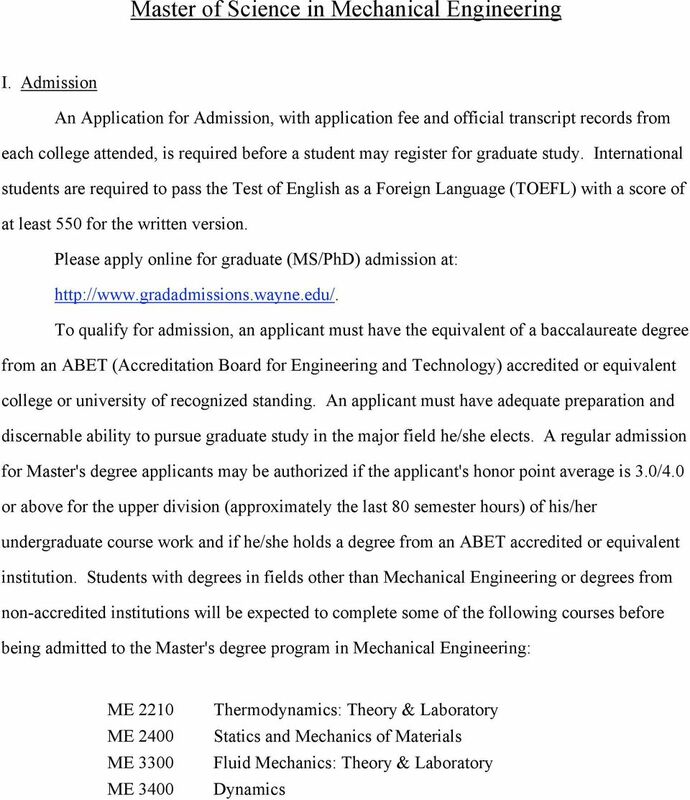 Course Requirements Three plans are offered by the Department of Mechanical Engineering leading to the Master of Science degree: a. Option A -- requires a minimum of 32 semester credits of course work including 8 credits of thesis. b. Option C -- requires a minimum of 32 semester credits of course work without thesis. 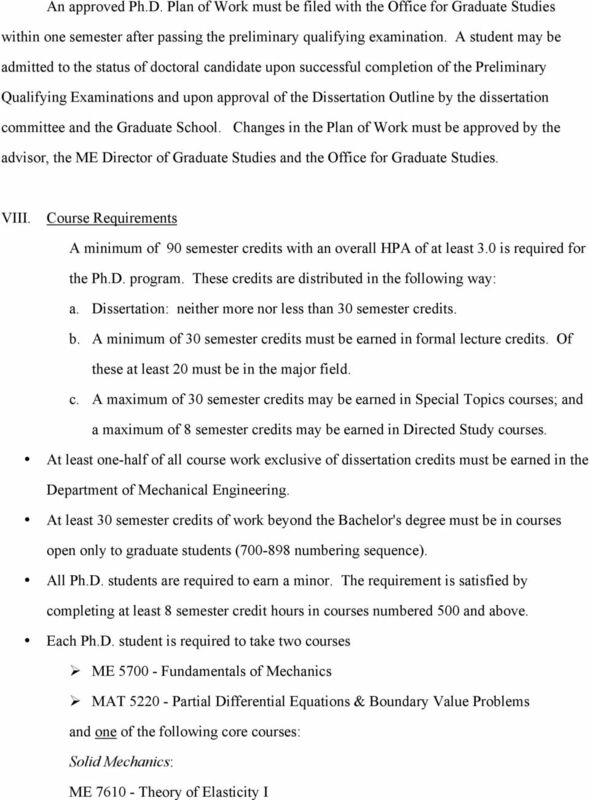 c. Option D: requires a minimum of 33 semester credits of course work including 1 credit of ME 6991 ( Internship in Industry ). Students can chose up to three semesters of internship with the permission of Graduate Advisor and OISS (Office of International Students and Scholars). The permission of OISS is required for international students only. ME 6991 (Internship in Industry) credits must be taken in addition to the minimum 32 required for the MSME under plan A or plan C. The student is responsible for arranging the internship in the industry. The student must have completed two semesters of studies as a full time graduate student before registering for ME 6991 ( Internship in Industry). 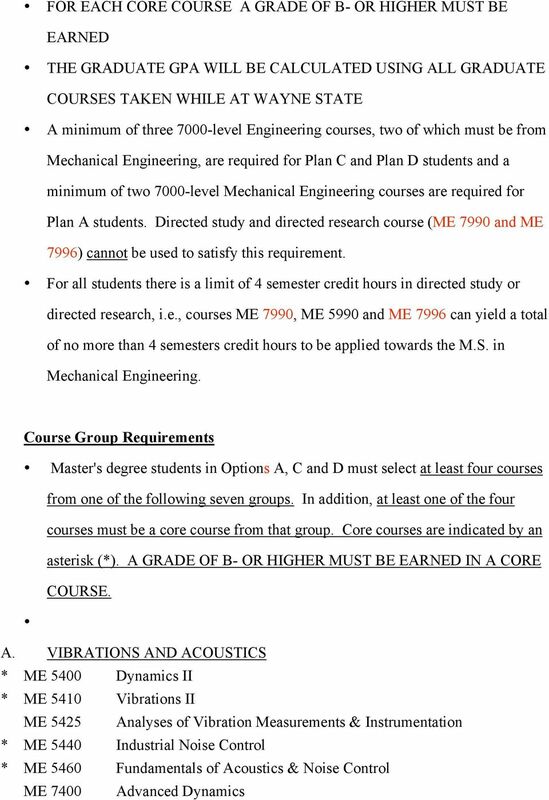 Note At least 24 of the total required 32 semester credit hours must be taken in the Mechanical Engineering Department. 11 * ME 5410 Vibrations II * ME 5600 Advanced Mechanics of Materials * ME 5620 Fracture Mechanics in Engineering Design * ME 5700 Fundamentals of Mechanics * ME 5720 Mechanics of Composite Materials ME 5730 Tribology and Lubrication Technology ME 7020 Finite Element Methods II ME 7100 Mathematical Modeling in Bioengineering ME 7610 Theory of Elasticity I ME 7680 Manufacturing Processing Mechanics ME 7720 Advanced Mech. 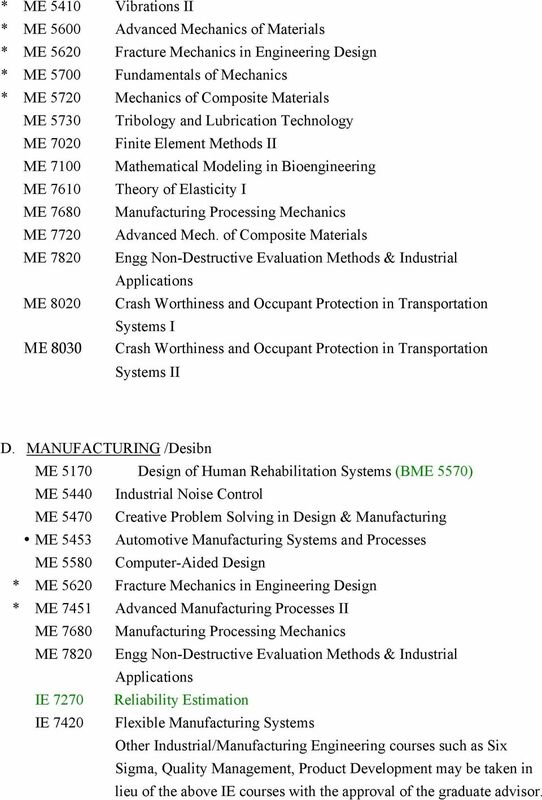 of Composite Materials ME 7820 Engg Non-Destructive Evaluation Methods & Industrial Applications ME 8020 Crash Worthiness and Occupant Protection in Transportation Systems I ME 8030 Crash Worthiness and Occupant Protection in Transportation Systems II D. MANUFACTURING /Desibn ME 5170 Design of Human Rehabilitation Systems (BME 5570) ME 5440 Industrial Noise Control ME 5470 Creative Problem Solving in Design & Manufacturing ME 5453 Automotive Manufacturing Systems and Processes ME 5580 Computer-Aided Design * ME 5620 Fracture Mechanics in Engineering Design * ME 7451 Advanced Manufacturing Processes II ME 7680 Manufacturing Processing Mechanics ME 7820 Engg Non-Destructive Evaluation Methods & Industrial Applications IE 7270 Reliability Estimation IE 7420 Flexible Manufacturing Systems Other Industrial/Manufacturing Engineering courses such as Six Sigma, Quality Management, Product Development may be taken in lieu of the above IE courses with the approval of the graduate advisor. 12 F. THERMAL/FLUID SCIENCE ME 5210 Convective and Radiative Heat Transfer * ME 5300 Intermediate Fluid Mechanics * ME 5800 Combustion Engines ME 5810 Combustion and Emissions ME 5820 Thermal Environmental Engineering ME 7200 Advanced Thermodynamics & Combustion ME 7240 Processes in Continuous Combustion Systems ME 7250 Advanced Radiative Heat Transfer ME 7260 Heat and Mass Transfer ME 7290 Advanced Combustion and Emissions I ME 7300 Advanced Fluid Mechanics ME 7310 Computational Fluid Mechanics & Heat Transfer ME 8290 Advanced Combustion and Emissions II ME 5110 Fundamentals Fuel Cell Systems (AET 5110) ME 5120 Fundamentals Alternative Energy Technology (AET 5120) ME 5850 Hydrogen Infrastructure and Alt. Fuel Transportation (AET 5410) ME 5870 Alt. 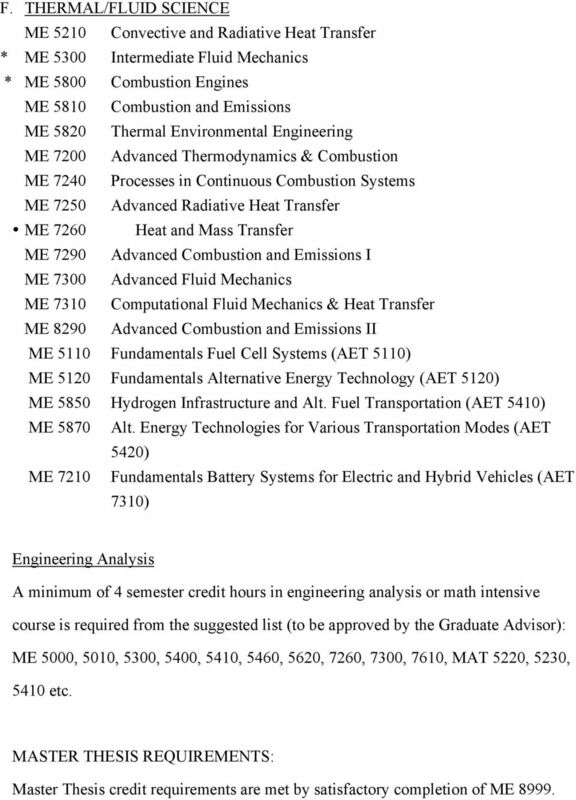 Energy Technologies for Various Transportation Modes (AET 5420) ME 7210 Fundamentals Battery Systems for Electric and Hybrid Vehicles (AET 7310) Engineering Analysis A minimum of 4 semester credit hours in engineering analysis or math intensive course is required from the suggested list (to be approved by the Graduate Advisor): ME 5000, 5010, 5300, 5400, 5410, 5460, 5620, 7260, 7300, 7610, MAT 5220, 5230, 5410 etc. 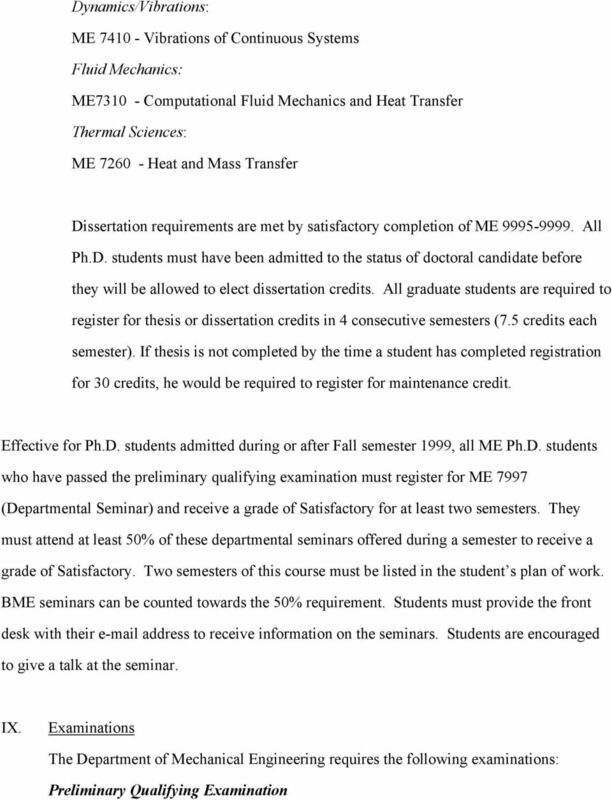 MASTER THESIS REQUIREMENTS: Master Thesis credit requirements are met by satisfactory completion of ME 8999. 13 Student Performance Requirements The overall GPA for MS graduation must be B or better. 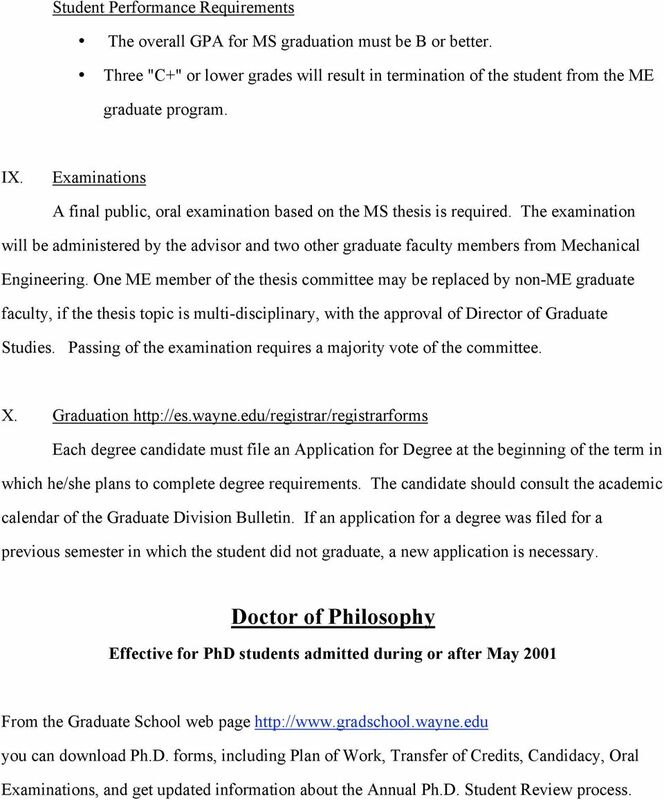 Three "C+" or lower grades will result in termination of the student from the ME graduate program. IX. Examinations A final public, oral examination based on the MS thesis is required. The examination will be administered by the advisor and two other graduate faculty members from Mechanical Engineering. 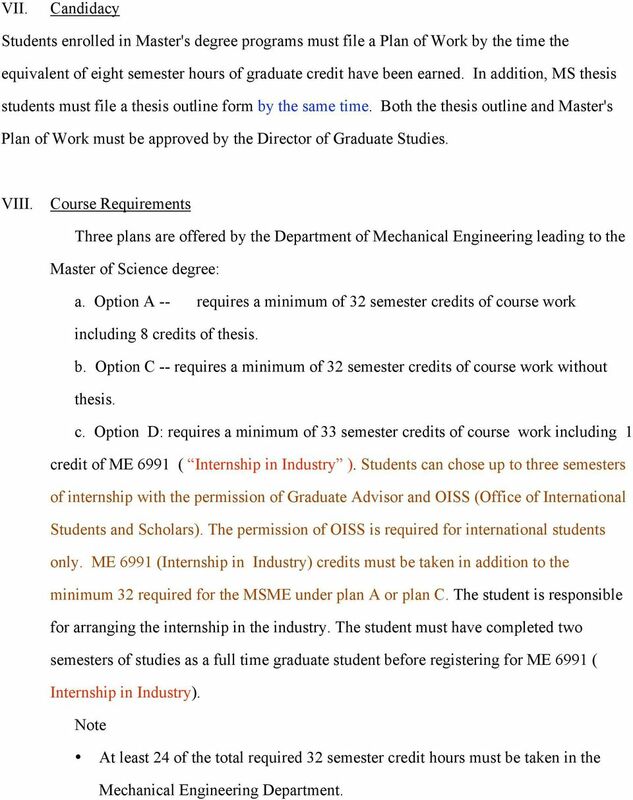 One ME member of the thesis committee may be replaced by non-me graduate faculty, if the thesis topic is multi-disciplinary, with the approval of Director of Graduate Studies. Passing of the examination requires a majority vote of the committee. X. Graduation Each degree candidate must file an Application for Degree at the beginning of the term in which he/she plans to complete degree requirements. The candidate should consult the academic calendar of the Graduate Division Bulletin. If an application for a degree was filed for a previous semester in which the student did not graduate, a new application is necessary. Doctor of Philosophy Effective for PhD students admitted during or after May 2001 From the Graduate School web page you can download Ph.D. forms, including Plan of Work, Transfer of Credits, Candidacy, Oral Examinations, and get updated information about the Annual Ph.D. Student Review process. 20 Candidate Maintenance status (9995) until the requirements are completed, the time limit for degree is reached, or the student withdraws from the program. Final Qualifying Examination: Each student is required to successfully pass the final Qualifying Examination which consists of written and oral parts covering the student's major and minor areas and other related fields. In addition, the oral part of the examination shall include a presentation of the proposal for the dissertation research. 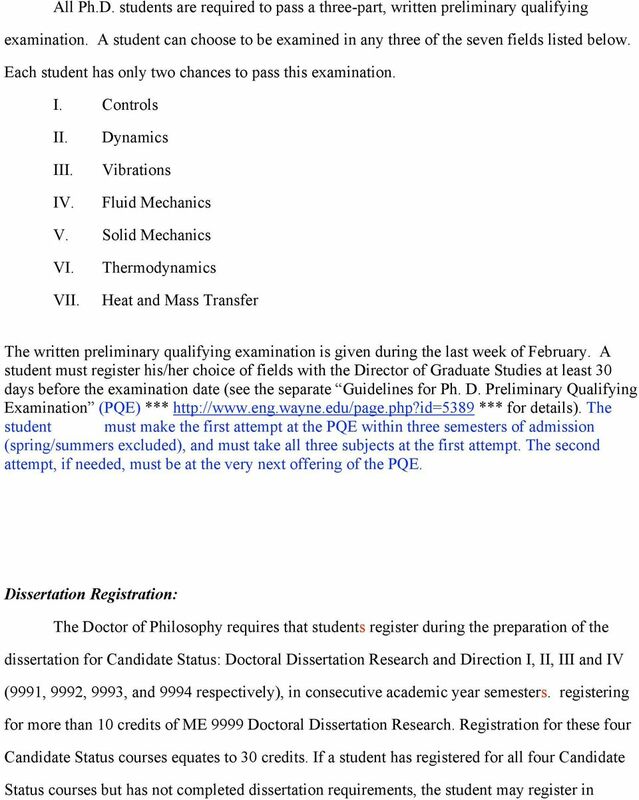 The Final Qualifying Examination is administered by the student's Doctoral Committee. Under ordinary circumstances, the committee members may not be changed before the Qualifying Examination (written and oral) have been passed. Under extraordinary circumstances the Office for Graduate Studies may approve a committee change, but such change shall require written justification and approval in advance of the examination. 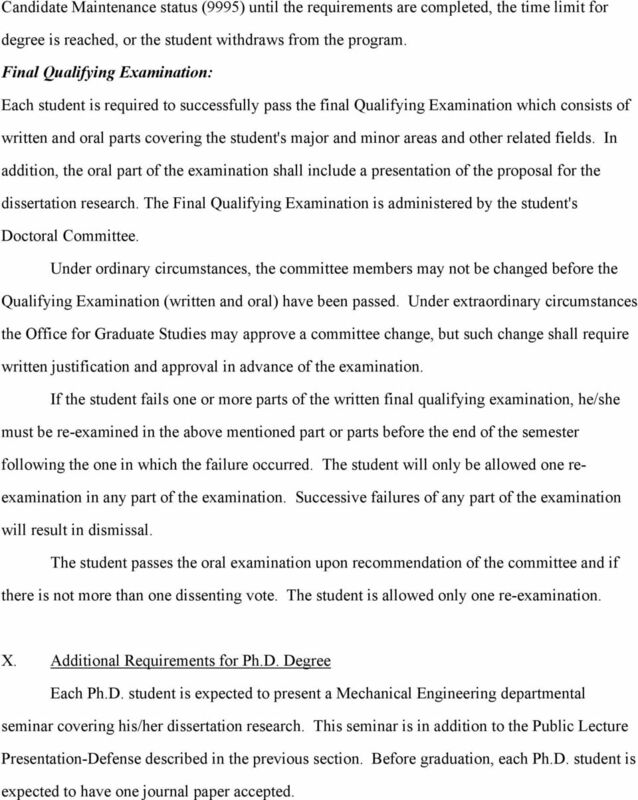 If the student fails one or more parts of the written final qualifying examination, he/she must be re-examined in the above mentioned part or parts before the end of the semester following the one in which the failure occurred. The student will only be allowed one reexamination in any part of the examination. Successive failures of any part of the examination will result in dismissal. The student passes the oral examination upon recommendation of the committee and if there is not more than one dissenting vote. The student is allowed only one re-examination. X. 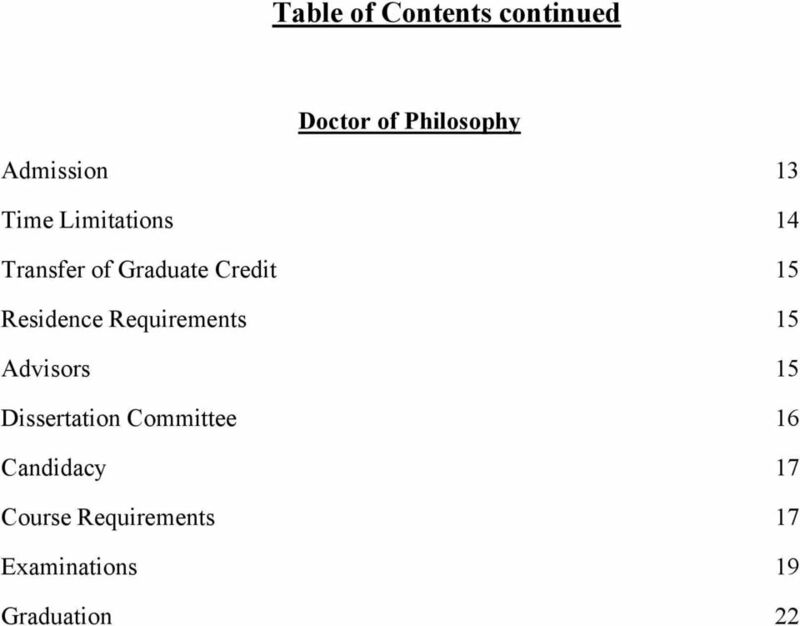 Additional Requirements for Ph.D. Degree Each Ph.D. student is expected to present a Mechanical Engineering departmental seminar covering his/her dissertation research. This seminar is in addition to the Public Lecture Presentation-Defense described in the previous section. Before graduation, each Ph.D. student is expected to have one journal paper accepted. 22 previous semester in which the student did not graduate, a new application is necessary. The student must be registered in the semester he/she plans to graduate. THE UNIVERSITY of TENNESSEE DEPARTMENT of INDUSTRIAL and SYSTEMS ENGINEERING College of Engineering GRADUATE HANDBOOK M.S. and Ph.D. in Industrial Engineering M.S. and Ph.D. in Engineering Management M.S. Graduate Handbook, Department of Biomedical Engineering page 1 of 50 Table of Contents INTRODUCTION 4 THE GRADUATE PROGRAMS M.S., M.E., BS/MS, H.C.T.M. AND PH.D. 4 STUDENT CLASSIFICATION. 4 1. FULL-TIME. Graduate Office: 263 Link Hall Syracuse University Syracuse, NY 13244 Graduate Secretary: Kathleen Datthyn-Madigan Email: kjdatthy@syr. 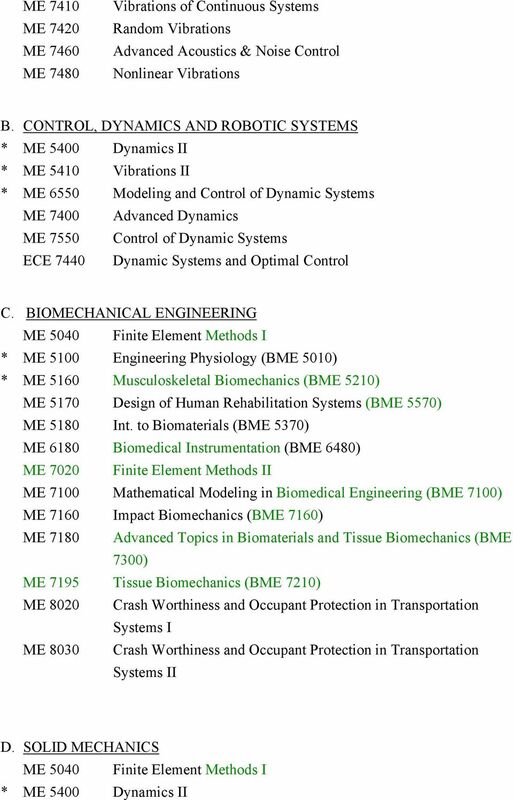 Biomedical Engineering Graduate Program Policies and Procedures Handbook 2011 2012 August 2011 TABLE OF CONTENTS 1. GRADUATE EDUCATION COMMITTEE 3 2. PROGRAM EXECUTIVE 5 3. ADMISSION REQUIREMENTS 6 4. Students select at time of application the option to which they would like to be admitted.